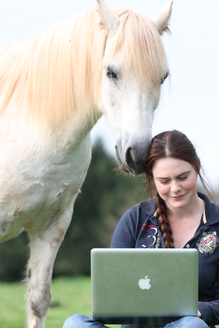 Do you live in an area where you cannot find the ideal teacher for you and your horse? Do you need someone that keep you motivated and help you achieve your goals? Then becoming an online student may be the solution. 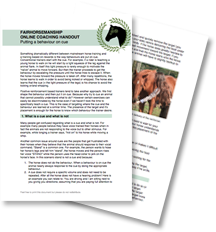 The education of your horse using humane and science-based methods. Your introduction to positive reinforcement/clicker training and liberty training. Creating a good relationship between you and your horse. A device that can make videos: At the end of each assignment you should send a small video for me to review. You do not need fancy filming equipment as most phones can make good quality videos. If you are alone and nobody can film you will need a some kind of tripod. An email address: Assignments and feedbacks are sent by email. Motivation: Online coaching is for people that are motivated to learn new things and do the best for their horses. Training equipment: You do not require any expensive training equipment and we can adapt the assignments to what you have available to you. Depending on your individual needs you can sign up for a set of 4 online lessons or a single online lesson. See details below. I am happy to announce a brand new service I am offering: online calls. Using an online meeting application I can now chat online with you, answering your questions and reacting to your training videos in real time thanks to the screen sharing option of the app. I recommend this services for more experienced horse trainers that do not require weekly support but simply need help with specific cases or that have a good understanding of the theory and just require help with their practical skills. Individuals interested in this service email me using the form provided below. They are then sent a questionnaire and in some cases are asked to film a video assessment. The questionnaire helps with the creation of the customised learning programme. This mean that not all online student work on the same assignment or receive the same instructions: this is personal support. For each assignment students receive written feedback including: what went well, what went less well and how to improve. It takes between 2 to 5days to receive this feedback along with the next assignment. In addition with the video assignments students are given theory lessons and small theory exercise to complete. Depending on their level and needs they either learn about learning theory or ethology. ✓ A questionnaire for all new students so your coaching is personalised to your needs. ✓ 4 assignments with detailed and printable instructions. ✓ 4 printable theory lessons (some including small exercises). ✓ All your questions are answered as quickly as possible (usually within 24hours). ✓ 4 detailed feedback of your videos (up to 10 minutes of footage). ✓ Access to a private facebook group reserved to students. 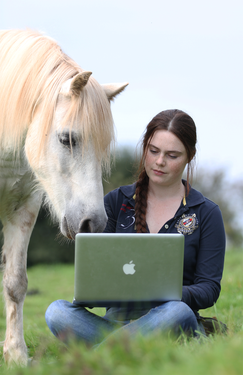 Indidivuals interested in a single online coaching lesson are first sent a questionnaire including questions about their horse, training and goals. They are then advised on whether to sign up for a single lesson or a set of 4 online lessons. Students then receive a training guide and are given a single assignment, which fit with their goals and needs. They must complete the assignment using the instruction provided, film it and email it. Students have a deadline of 3months to complete their assignment. Deadline extension may be provided in the case of death or illness. Once the video assignment has been received, the students are sent a written feedback, which include: what went well, what went less well and how to improve. It takes between 2 to 5days to receive this feedback. • You are an intermediate/advanced clicker trainer and just require help on a specific exercise. • Want to try online coaching without needing to commit to a set of 4 lessons. • Require more time to complete assignments (deadline is 3months instead of 1). ✓ 1 assignment with detailed and printable instructions. ✓ 1 detailed feedback of your video (up to 10 minutes of footage).